The upcoming Gitex Technology Week in Dubai, Mena's leading ICT exhibition, is hosting Ubifrance, the French export-support agency, which will present 25 French digital companies on the French pavilion. 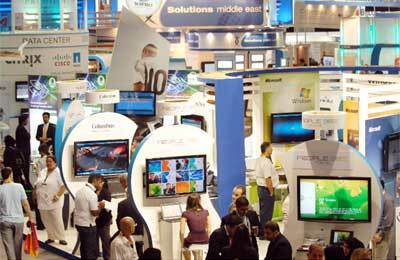 Gitex is running from October 14 to 18 at the Dubai World Trade Centre. The French Pavilion will host the French exhibitors in approximately 243 sq m across set into the Business Solutions hall. A wide range of products will be exhibited, including those relating to business IT, business communications and networks, ICT infrastructure, IT and telecoms accessories, Future Internet, consumables, open source, cards technologies, electrical protection systems, consulting, mobile content, HR IT solutions, electronic devices for taxi drivers, and more, a statement said. According to the European Information Technology Observatory (EITO), worldwide IT expenditure is experiencing substantial growth rates in emerging countries and should have risen by 4.3 per cent in 2011, reaching 963.4 billion euros ($1.25 trillion). In Europe, France enjoyed a 3.4 per cent increase in expenditure. The EITO highlights the substantial upsurge — by 4.2 per cent — in the French infrastructure software segment in 2011. This trend is expected to continue in 2012, with a forecasted 4.8 per cent rise. The growth in this segment is primarily the result of rising sales in storage- and security-applications solutions, boosted by the proliferation of Cloud Computing offers. Also according to the EITO, the worldwide IT market in 2012 will grow by 5.4 per cent, exceeding 1,000 billion euros in sales for the first time. E-Citiz is positioned as a reference in the design and deployment platforms for web-based self-service portals, by claiming to be the most comprehensive and accomplished on the market. This year the new features include mobile access to the business processes (Android, iOS, BlackBerry) and BAM (Business Activity Monitoring). Evolis manufactures solutions to personalise plastic cards. The company will introduce Primacy, a new high-performance card printer designed to deliver single or dual-sided cards. Kurmi Software is a provider of provisioning and management applications for Unified Communications platforms. Bee Ware is a software developer specializing in securing and optimizing Web applications. Available in the form of an Appliance, Bee Ware’s solutions guarantee both performance and trust, enabling Web technologies to be used with total security. MobiWire SAS has launched its new MobiPrint device able to process transaction and data exchange via a connected printer called MobiPrint. MobiPrint is an all-in-one device which can provide an instant and secure data exchange for financial or similar use with real time online reporting and supporting off-line transactions as well. Office Gemini will present its two new lines of software. Dokmee is a turnkey document management software including all DMS features with a very attractive price point. Diamond vision is a scanning software which provides powerful production level image and data capture with no per click charges or limitations on scanning and OCR functions. Cassiopae is a worldwide leader in asset finance software. Delivering solutions for improving loan and lease management has been its exclusive focus for over 25 years. Cassiopae will be exhibiting its full web solution which is integrated Front to Back, composed of mainly four modules for lease & loan management: Front Office, Middle Office, Back Office and Accounting. Newnet3D is a major leader in real-time web3D communication and collaboration. It provides a wide range of innovative and interactive solutions for 3D virtual tradeshows, meetings, seminars, web-conferences, forums, open house days, showrooms, galleries, classrooms and serious games. The company will introduce its new eco-designed web 3D solutions for virtual events with no plug-in to download. SSL Europa is the IT security specialist for server and client strong authentication, electronic signature and dematerialized traceability. SSL-Europa is the reseller for EMEA, former CIS, and South of America of the digital SSL Certificates issued by the French CA, Keynectis. The company will present new ranges of solutions to secure transactions, certify dematerialized documents and authenticate users on workstation. Preactor delivers a range of planning and scheduling (APS) solutions for manufacturing companies. Easy to integrate with ERP and MES, companies can obtain a return on investment in just a few weeks by increasing efficiency, reducing inventory and work in progress and improving on-time delivery performance. Infosec Communication designs, manufactures and sells a comprehensive range of UPSs and surge protectors adapted to market needs. Infosec UPS System offers electrical protection systems. HR Access designs, develops, implements and delivers a complete set of HR solutions (Payroll, HR administration, Strategic HR management) delivered via “in-sourcing” and “outsourcing” model. ATA is specialized in the design and manufacturing of electronic devices for taxis like taximeters, roof lights, printers, payment terminals, passenger information screens, CCTV, fleet management systems and dispatching services. All of its devices can communicate with each other thanks to a smart and secured protocol over serial or Bluetooth links. Taztag specialist in contactless technology, will present to the region a complete range of products for the deployment of new applications based on a unique association of short range communication (NFC) mid-Range communication (Zigbee with range management system), secure element & cryptography, and Biometric control. Teclib is a specialist in free technology and open source industrialisation. On account of its partnership with Oracle, the company currently uses Virtual Desktop technology, an innovative solution that allows the virtualisation of workstations.